Jane Smiley has launched a new trilogy titled The Last Hundred Years focusing on, unsurprisingly, a century of time. Some Luck, the first novel of the series, begins in 1919 in the heartland of central Iowa focused on a family of fivec children. Smiley read from the book at BookCourt last week. Each of the three volumes covers about thirty-three years wrapping up the trilogy in 2019. The second book is expected in the spring, and the third in fall of 2015. That of course means the final book will ultimately looks to a future yet unexperienced. Smiley read from the early years of the book approximately 1920 and then another section from 1945. 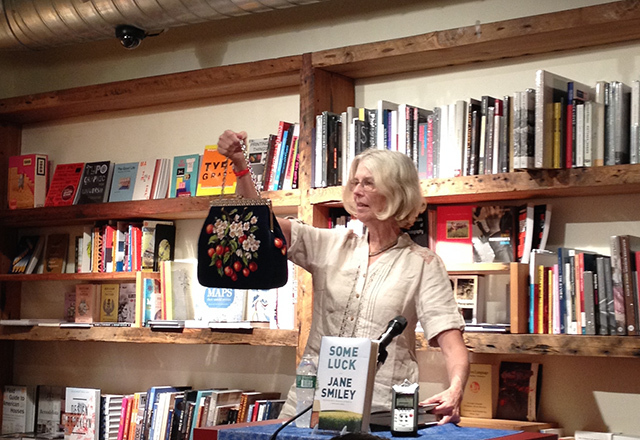 She brought with her a vintage handbag from the 1930s that she shows off as a kind of memento from the book’s era. She jokes she’ll need to buy one with leather fringe for second volume that spans the 1970s. The first thing that came to her was the title of the trilogy. She knew she wanted to write an epic spanning a century, although she admits nobody, including herself, wants to read fourteen-hundred page novel. In conceiving the book, she knew she wanted more than just two or three pages for each year, and there was no way to cram a hundred years into a single volume. The whole story began with the idea of a farm. Children had children, and some of them had to move away. Smiley says the hardest part was figuring out what to cut. “As their god I knew what was coming along,” she says, but adds the characters themselves had freewill. “If it were up to me, I would have ended volume one in the middle of a sentence,” Smiley explains. While each novel does function on its own, the complete story is really the entire trilogy. She wrote the whole thing in sequence, but adds that each book was written individually. She wrote the first volume as a volume. After letting the manuscript rest and another read through, she started the next volume. All three are finished at this point. With a book spanning a hundred years, there is plenty of room for historical details. Smiley did lots of research on details like makeup, clothing and accessories. “You cannot imagine how much information there is,” she said, referring to niche fashion websites. “People all over the web have their hobbies.” She seems awed by the kind of detail people have put into collecting this kind of information. Smiley said she never expected to write another farming novel. But she also didn’t see how she could talk about the previous hundred years without talking about how people got their food. Farming was integral to that.